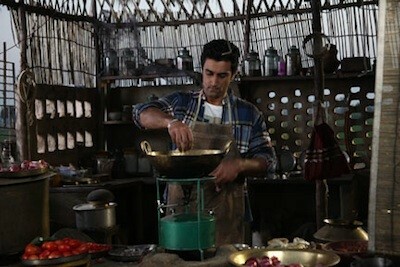 Kunal Kapoor, playing Omi Khurana, works on the title recipe. Having just closed Barfi! after an unexpected monthlong run, today River East opens another comedy from UTV Motion Pictures, the Indian multimedia conglomerate recently purchased by the Walt Disney Company. It's called Luv Shuv Tey Chicken Khurana, and with an attention-grabbing title like that, how could they lose? (I have no idea what "chicken Khurana" is, but it sounds delicious.) The unsubtitled trailer promises more of the qualities that made Barfi! so much fun: vibrant colors, cartoonish characters, an ingratiating pop soundtrack, and gorgeous regional locations (this time, in the Punjabi villages of northern India). Omi Khurana's London dream has just ended. On the run from a dangerous UK gangster who he owes money to, Omi returns to his native village in Punjab, pretending to be a well-heeled London lawyer. Much has changed since Omi ran away from home a decade back after stealing money from his doting grandfather, Darji. The old man has since become senile and most importantly, forgotten the secret recipe of "Chicken Khurana" a dish that made the Khurana dhaba (restaurant) famous across Punjab . . . Will Omi be able to cover his deceit and lies for long, even as he tries to recover the lost recipe of "Chicken Khurana"—the family's only hope to reclaim their pride and wealth? This sounds absolutely trivial, but not unappealing. (The few reviews I've skimmed online suggest I'm not too far off.) In my ongoing discovery of Indian cinema, I've come to appreciate recent Bollywood genre movies for aspiring to what most of their Hollywood counterparts have long stopped doing: entertaining a broad cross section of viewers, rather than a target demographic. While Bollywood hit movies regularly simplify conflicts and characterizations in order to appeal to younger audiences, they also gain in a certain universal quality—that mythic aspect of popular filmmaking that Leos Carax, in his upcoming Holy Motors, regards as endangered. Having just rewatched Carax's latest, whose adulation of movie magic evokes a romantic poet caressing his dying lover, this uncomplicated chicken dish may be just what I need.